The role of Lord Renly Baratheon was one that many fans were interested in seeing cast. Filling the role is Gethin Anthony, who brings his talents to bear on a character whose role in this season culminates in a crucial decision . . . and who may well go on to become one of the chief players of the game of thrones if a second season is commissioned. Below is our interview with the actor, discussing his early career, the auditioning process, his views on Renly and Renly’s family, and more. We know you read English at Oxford, but you also performed some theater there. Was that part of your education or was that extra-curricular? I studied English Language and Literature for my B.A., but there’s a great theater scene in Oxford—there’s a lot of theaters there—as well as a burgeoning short film scene as well. There’s a lot of people interested in it, and because it’s not actually a course at Oxford, you do it as an extra-curricular thing. There were quite a few societies and organizations there—the Oxford University Drama Society, the Experimental Theater Company, a great company called Crackhorse Productions as well to name a few—who were putting on plays and being very fortunate and privileged to have the space, the resources, and support to do it. We were supported by people like Thelma Holt, who’s a big producer here, and Cameron Mackintosh, who give up their time and money to help students put on their productions. It was a big part of my life while I was there? When did you decide to become an actor? I did school productions from around the age of 12 and I was very fortunate around talented, inspiring people. Steve Thompson was a maths teacher at my school when I was a student—now he’s an Olivier-nominated writer—who did productions with us when I was young, and there was my drama teacher Frank Whately who’s a big theater professor at Kingston University. He helped get the Rose Theater built in Kingston. So, I’ve been around a lot of theater people, and I’ve many friends who are actors or are involved in the business in some other fashion. We did productions every year, and I was really into it. When it then came to further education, I decided I wanted to do an academic degree, and looked at drama and English degrees when the opportunity came up to study at Oxford, which seemed too good to turn down. I always knew it was a big part of my life. As soon as I got to Oxford, I just got stuck in the theater scene and everything went on from there. Then you went on to LAMDA, the London Academy of Music and Dramatic Art? Actually, the first thing I did was become actor-in-residence at my old school, which was great. I had a job that gave me flexible hours, so I could go to meetings and auditions. I had gotten an agent while I was still at university. I did little things then. I did a little part in Into the Storm which was a BBC and HBO co-production. After that, I knew I wanted to train more as an actor, so I went to LAMDA after that. Do you have any preferences in terms of your past work, or in the kind of work you like to do? I was fortunate at university and drama school. One of the last things I did at university was playing Cyrano de Bergerac. It’s a wonderful role to play. At LAMDA, I got to work with Mark Ravenhill on a brand new play he wrote for us to premiere at drama school. It was a fantastic drama about dancing girls during the first World War and their lives and the show business around them. I like trying new things all the time, and I enjoy both the classics and new things. When it came to Game of Thrones, had you auditioned for the pilot first? They actually did call me for the pilot. The casting director, Nina Gold, is fantastic. I’ve met her a few times over the years, and she’s been very good to me. So I came in and read for some parts, and I didn’t really feel like I was right for anything—I think they didn’t either—but the nice thing was that when they came back a year later, they came back with Renly. It was a part I was really excited about, and a story I was really interested in. It was so filled with drama and personal conflict for him. It was terrific that they had the space and time to tell the stories of characters like him, who weren’t leads. What’s the audition process actually like? Nina is a great casting director, and that’s no secret. Her process is really great, it’s one that works well, and a lot of other casting directors use that way. You’ll go in in front of the camera, with her or one of her associates, such as Robert Stern, and the producers or the director might well be there. In a project like this, there’s so many people involved in the process, that it takes a great casting director to be at the center of that and to also know so many actors and pick out the right people to audition. All actors appreciate getting feedback, getting someone to bounce ideas off of, so having notes from the casting director is really helpful and a chance to get your approach right. Being able to read scenes with Robert Stern in auditions is a real joy, because he’s an incredibly talented actor. He won’t believe you if you tell him, but he really is. He read with just about everyone in the course of all the casting. They’ll give you notes or ideas, and that just opens everything up. And they know you so well, so they know when you’re letting yourself down and they’ll help you deal with that. It gets especially nerve-wracking towards the end, when the producers or a director might be there, and they might direct you in the way they would on set. When you auditioned for Renly, what scenes did you use? 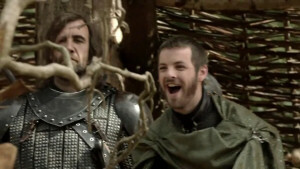 An important, big moment between Ned and Renly. That’s the scene I had. Also, there were some council scenes as well, just sitting around with all of those characters. I remember wondering who was going to play all of these guys, and I’ve never been quite excited as I was when I sat down at that table with Aidan [Gillen], Conleth [Hill], Mark [Addy], Sean [Bean], and Julian [Glover]. And then we had Dominic Carter, who plays Janos Slynt, coming in as well. It was all these guys, it was really exciting to watch them work. Did you research the role right off when you had the opportunity to audition? By the time that I was up for Renly, I had been aware of the books for a year, and by the time I got the part of Renly I had read A Game of Thrones. When they sent me the audition information, I went straight on-line to get any other information. The resources on-line at Westeros and even Wikipedia are pretty incredible, and they’re fantastic for summarizing things when you just have a couple of days. Getting a sense of where he might be going was very helpful. I quite like reading up on that. I’ve never actually played a character from a novel before, so that was different but interesting. But I also had to put it aside at some point Renly is the youngest of the Baratheon brothers, quite a bit younger than both of his elder siblings. There’s a sense in the novel that he’s not taken very seriously, perhaps because of his age, because he doesn’t have the warrior’s reputation his brothers have. Is this something that he resents? That’s a really interesting question. I think it’s fair to say that even in the first book he starts to grow up, from the guy who’s able to take the mickey out of Joffrey for getting beat up by a 9-year-old girl to where at the end of the book he’s really trying to do what he thinks is right for the realm. 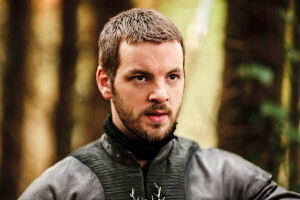 I do see Renly as part-politician. He enjoys himself, he’s very cultured, he loves fruits and drink—but he doesn’t eat too much, he doesn’t drink too much, as opposed to King Robert who drinks and eats way too much. Whilst he can play that social character that can get up and bow to the crowd after being unhorsed at the tourney, and people will cheer him, there’s at the same time a steely nerve beneath, and some of the characters make the mistake of underestimating him. It’s a useful headspace for Renly to think that people aren’t quite taking him seriously, that that gives him some power over them. But that said, he’s also to the manor born, he’s part of the council. He’s grown up as part of a royal family, so he has that kind of confidence… and for nothing, really, which was an important part of it for me, to connect to that kind of confidence. How do you see Robert and Renly in their interactions? How does Renly see his brother? It’s fair to say that Renly doesn’t ignore the fact that his brother was a great warrior and achieved so much through his own efforts. But it frustrates him that Robert’s frittering away everything he’s achieved. He doesn’t have a particularly great relationship with the Lannisters, so that family dynamic complicates things further, when Cersei and Jaime are around and about when he perceives them as a threat. One thing that I think we really got right is that he really does care about the kingdom, and the people in it. He takes seriously their responsibility to protect them. It’s a difficult thing to get across, because he is to the manor born, he is light of heart when it comes to humor, but I think it was useful to think about the responsibilities they had in running the realm, and how that affected him. So, as to my relationship to Robert, I do think he respects him and he has a fraternal love for him, but there’s a frustration that his brother isn’t running things as he thinks he should. When talking to Finn, he mentioned that Loras and Renly had a kind of vision for how things should be. Yeah, we had a great chat with Bryan Cogman about the situation in Westeros, and their stakes in it, and what it also meant to have certain relationships in that world. It was exciting to then think about how Renly thought how things ought to be, how much more enlightend it’d be. “Enlightened” was a word that I hit on which is something that I found useful to think about in relation to Renly. We know there’s a relationship with Loras. Did they tell you when you were going after the role that that would come up? No, not really. They just told me that the character has a really good story and that I should look it up, so by the time I auditioned there was no surprise for me about their relationship. It’s a part of the books that’s beautifully told in the books, because it’s so hand’s off and it’s exciting to play a character who has a big secret. When I visited in October, Bryan had given George, Parris, and I a tour of Paint Hall and we saw everything except the Red Keep, which Bryan explained because there was some sort of intimate kind of scene between Finn and yourself… Did you have to steel your nerve at something like that, knowing that there’ll be many female fans who’d be quite happy? You know, that particular day’s filming wasn’t too drastic. I think that was really out of respect for the quietness of the scene, really. You do tend to treat that scenes with have a lot of emotion in them a little differently, maybe. The really special piece thing for me was getting to work with Finn, because we had built up a great relationship. That was great. Moving a bit into spoiler territory, for fans who are familiar with the books. A lot of the actors have read some of the books, and I know you were at leat part way through A Clash of Kings at some point. How far have you gotten? I haven’t had a time to get past the second book, but I did finish it. But you know, after my work was done for this season, I’ve not had a lot of contact with the material partially because it’s great to just get out of that headspace as I move on to other things. It’s great seeing all the teasers and videos and things, but I did have to take a step back for awhile. But if we get to film any more of the series, I plan to read more of the series. I do know some of the actors have read all the books. I know Ian McElhinney (Ser Barristan Selmy) is a big reader, and he’s read all the books and was really excited by them. What do you think about the internet fanbase in general? Miltos mentioned that when the actors went to the moot that there was a bit of gathering in the bar to steel themselves a bit. It’s really, really exciting really. I’ve never been involved in anything like this, with such a fanbase. I think what Miltos may have been touching upon a bit is the sense that we might feel a lot of responsibility to try and live up to those fan expectations. But the Belfast moot was a fantastic evening, and we all had a whale of a time. And it was so informal, which was terrific. I think that was part of it as well, because we’d never done anything like that before, and we didn’t know how formal it’d be. But it was great, hanging out, having a couple of drinks. It was just like going out to a pub. Oh, I was pretty gutted. Loras’s armor you’ve seen, and it’s the most glorious armor you’ll see. But what I do think is amazing is how much actually stayed in. Would you have liked to do that, the riding and carrying the lance and so on? Oh, yeah. I kept teasing Finn about how jealous I was that he got to ride horses all day long. Part of the excitement of this job, of being an actor, is that you get to do things you’ve never done before. The idea of being a warrior or riding around on horses is really exciting, and I really, really hope I get to do that at some point. When things proceed in the story, where Renly puts forward an argument at a crucial moment that ends up rejected, what was your take on that? This is what I meant about Renly growing up through the book. It’s the sense that great events in a person’s life can change you in a moment and rewrite your vision of the world. In almost a heartbeat, Renly has to reassess everything. I recall discussing this, and wondering whether he ever thought he might be in the position to make the choices he did, whether he imagined that it would ever happen. He’s the sort of person who’ll seize the bull by the horns, who’s young enough and impulsive enough to really seize the moment to try and put things right as he sees it. It’s no secret that he’s not a big fan of the Lannisters, and he isn’t the sort of character who’d let the status quo stand if he felt it was wrong. One of the great achievements of George’s books is that he gets the sense of politics. He doesn’t just send armies crashing at one another, he looks at all the aspects of governing a nation, the politics, the logistics, and so on. Looking at the story, would you make the case that Renly is best suited to being king of all the characters, including war? Yeah, I would make a case for Renly! I’d make the case for Renly based on, if the world was one that wasn’t under the threat of constant war, I think he’d be a perfect king. He has a sensitivity to money, making jokes about his brother’s frivolous ways, and so he kind of has that control. And he’s part politician, and you need that kind of mind to be able to deal with things in a reasonable way, rather than just the blunt agression which his brother often favors. But the truth of it, he’s a young man, and he does live in a bleak, dangerous world. Whether he’d be a complete king… ? I don’t know, but I’d certainly give him a go, why not try it? Maybe it’d be a more enlightened and cultured place. Part of the whole process is not just actors translating the characters to the screen, but the production side, the costumes, sets, and all that. Is this the largest production you’d been involved in? Into the Storm was really fantastic, as I got a little glimpse of how the BBC and HBO do things. But as far as scale? Yeah, it was far and away the largest thing I’ve done. I remember when they flew me over to Belfast, and that was the first on-set experience I had well before filming started. They were building the sets in Paint Hall, and someone just went, ‘Do you want to walk through the armor room?’ And by armor room, they mean warehouse. I got giddily excited and said, ‘Yeah.’ It was really great to see things like Jaime’s armor, and I was just over the moon seeing it. It’s a huge production, with extraordinary sets and locations. And the way they can manipulate things, turning a room around and suddenly it’s a completely different space. 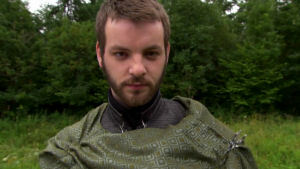 Renly’s costuming for example is amazing. The detail in the metalwork of those brooches is just extraordinary. I so wanted to keep one. The stuff that Michele’s doing, especially, with the costumes, I loved it. I thought it was amazing. In all honesty, the people who create this stuff are so committed. I remember at one point that there was a piece of leatherwork that wasn’t quite fitting right, and I know for a fact that this woman on the team stayed up all night to get that all sorted out so that it was ready the next morning. That kind of commitment from the team is something else. It’s a shame that you don’t get to meet and know every single person involved, because how committed they were and how skilled they were. It’s easy to forget when you’re watching the final product is how many people are involved. I recall having a number mentioned to me when I was in the production offices, and it was mind-boggling to me—a large village’s worth of people, all working on this one thing. The biggest day of filming I recall involved something like five hundred people, which was just incredible. So if we get a second season (knock on wood), is there any scene you really want to see or that you’d like to act in? Oh, that’s two different questions. There’s one scene when Daenerys goes into a kind of labyrinth… that stood out as an incredible moment in the book, which took the story to a whole other place. And I admit, I really want to meet Stannis. I’m intrigued by this guy, and he’s a big figure in my imagination, because he’s this older brother that’s only mentioned and not seen. I see Christopher Eccleston in the role of Stannis. Yeah, he’d be fantastic. That’s another thing when you sit down at that council table, about this production, that you know that all the actors are going to be top-notch. What’s next for you as we all wait for word on a second season? I’m rehearsing a play at the moment at the theatre called the Royal and Derngate in Northampton. It’s a fantastic regional theatre, and it’s a beautiful play called, “In Praise of Love”, that will run for a month or so [Note: the play is now being performed; see here for details]. I just finished producing a short film with my production company, and I’m writing a radio play as well, so I’m keeping busy. But touch wood, we don’t know what will happen in the latter half of the year yet, so we’ll have to see.